And we've talked about some pretty cool stuff. Harold B. Lee said that the beatitudes are the constitution for a perfect life. So be meek. Thirst after righteousness. Be merciful, pure in heart, and a peacemaker. Actually, watch that video again and write down all of the beatitudes and the blessings you will receive if you live this... constitution. I will start you off. If you are poor in spirit... the Kingdom of Heaven is yours. Something interesting that my seminary teacher talked about yesterday was fulfillment. He talked about how when Christ was ministering to the people... he made the Sadducees and the Pharisees nervous and upset. The people followed the Law of Moses. They worried that they would lose their authority and power to this Savior. Well... I guess that theirs is another story, but understand that Christ didn't come to destroy the law, but to fulfill it. Matthew 5:17- Think not that I am come to destroy the law, or the prophets: I am not come to destroy, but to fulfill. Okay so I know that this is really hard to see. It is a worksheet that explains how the Law of Moses was fulfilled, not destroyed. 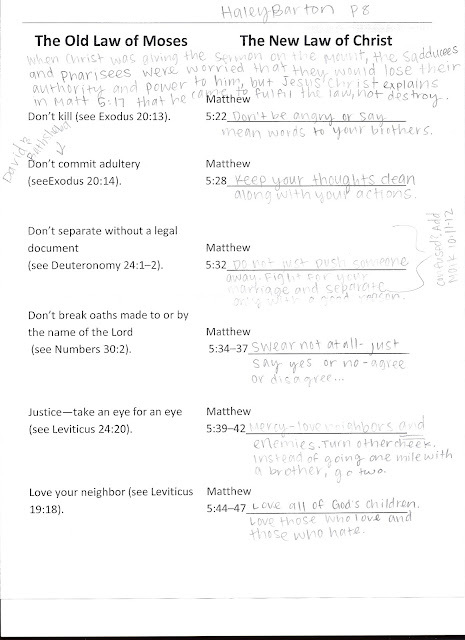 Instead of saying don't commit adultery, he adds more. Keep your thoughts clean, too. Don't just love your neighbor, love your enemy. The same applies to the Gospel as a whole. Often times people will explain to you that they don't need religion. They are happy the way they are. And they are right. People can still be happy without being Mormons... that is important to remember. Living the teachings of and believing in your Savior simply makes things more... what's the word... hmmm... peaceful. Take people of other Christian faiths, for example. From their church they are building a solid foundation and learning to have faith in Christ. Sharing the Gospel with a friend helps build upon the foundation that they already have. Don't look to change the person... look to maybe... complete them? Everyone should understand that God loves them. No matter who they are. No matter what they believe. No matter the choices that they make. Never think that God isn't proud of you. Not for one second. Don't think that He won't be happy to receive you. The heavens will cheer when you return. Your mistakes do not define you. The past is past, so leave it there. And start with just little changes. 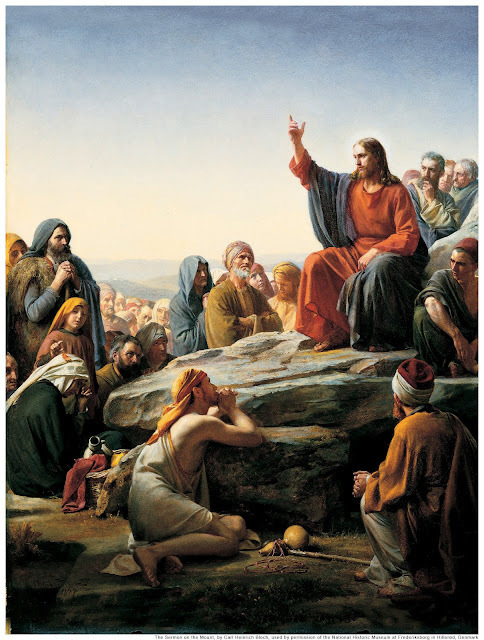 Something else we talked about in seminary was Christ calling his very first apostles. They were mending their fishing nets when the Savior asked them to follow Him. Because they were committed. They were willing to give up all they had for the Savior. They knew they would be blessed for doing so. So what are you being asked to give up? What is the Savior asking you to leave behind? Probably smaller things than Peter, James, John, and Andrew left behind. Remember that God is on your side. He wants what is best for you. He wants you to turn to Him. I think that you are always, always worthy enough to pray. So learn what His will is for you. And start learning the constitution for a perfect life. And the Kingdom of Heaven will be yours.